Situated at the foot of the Hallingskarvet National Park, as the gateway to the largest high mountain plateau in Northern Europe - the Hardangervidda National Park and in the upper reaches of the Hallingdal valley, Geilo (794 m above sea level) welcomes all nature enthusiasts to its many fine activity and lodging facilities. In 2008 Geilo was given the status as a National Park Village. Geilo belongs to the municipality of Hol, which consists of 8 small villages and towns (Dagali, Skurdalen, Geilo, Ustaoset, Haugastøl, Hol, Hovet and Myrland/Sudndalen). A total amount of approximately 4500 people live in the municipality (slightly increasing). The largest town and shopping centre is Geilo, with about 2500 inhabitants. The administrative centre is in the village of Hol. Area: 1889 sq. kilometres, the majority of the land is mountain and hill-land, 91% above 900 m above sea level. Hol municipality is the “entrance” to the largest high mountain plateau in Northern Europe – the Hardangervidda National Park, a particularly valuable highland area and the largest national park in Norway. The area is important as the home of the largest wild reindeer herds in Europe. Hallingskarvet National Park (450 km2) is also close by, with the highest peak in Hol, Folarskardnuten, 1933 m above sea level. Evidence of how people have utilized the natural resources, especially the reindeer, is prominent in Hallingskarvet and on Hardangervidda in the form of paths, tracks, shelters and animal traps. The hunting and fishing resources are still actively used, and the possibilities for cross country skiing and hiking are nearly unlimited. At Fekjo by the Ustedalsfjorden lake in Geilo there are many cultural relics from the prehistoric and historic times. The burial mounds in the area is from the Viking Age (900’s). 10 of the approximately 20 burial mounds were investigated in 1923. Among the findings was a small ax blade of iron, a sewing needle and key to a casket. It is interesting that most of the investigated barrows were female graves. Iron extraction: there is registered 7 coal pits and ironworks in Fekjo, and several hundred coal pits all over Geilo. Today, in Fekjo, there are only a few coal pits left and the ironworks plant is gone. The charcoal which was made in the pits, were either used in iron production or in the smithy on the farm. Throughout Ustedalen valley (Geilo) there has been an unusually high activity in iron production from both Viking and medieval times. The many coal pits and ironworks plants show that it was made more iron than was needed locally. Iron was probably an important commodity for people in Ustedalen in Iron Age and Middle Ages. Smithies in Geilo. 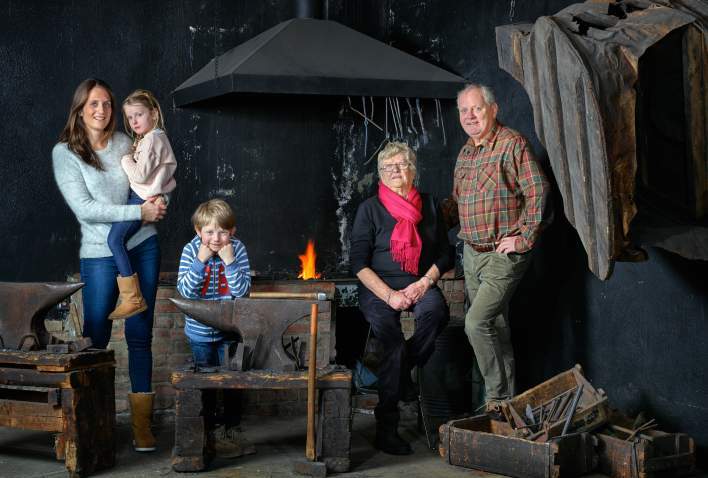 Brødrene Øyo (1882) produced mainly scythes and tools, today mainly tools, kitchen tools and - knives and cutlery. Brusletto (1896) also produced scythes and tools, today mainly sports knives and kitchen knifes. Skaugum Bestikk (1943) still produce cutlery, with permission from the King to use the brand “Skaugum”, the name of the farm of the Royal family. At Fekjo there is an old hay barn and a barn. Until approx 80 years ago it was a mountain farm here. After mowing, hay was stored in the barn before it was driven to the farm with horse and sleigh in winter conditions. An old stone fence in the park is probably a distinction between hayfields and pastures. Geilo has for several hundred years been an important stop along the old routes across Hardangervidda, used by traders going East and West, transporting animals and goods for sale. The British Barons of Garvagh (the Canning family) came fishing and hunting in the mountains from the 1860’s and onwards. They sailed in to Flåm/Aurland in the western fjords, and travelled up to the mountains of Hol for reindeer hunting. They hired residents of Myrland/Hovet as guides and to raise several small hunting cottages in the mountains, some of them are still in use. The opening of several hotels in the years 1890-1915, of those are Geilo Hotel (1890) and Dr. Holms Hotel (1909 -started as a sanatorium in the fresh air of Geilo for people with lung diseases) still in operation. Bardøla Høyfjellshotell opened in 1948. The opening of the Bergen Railway in 1909. 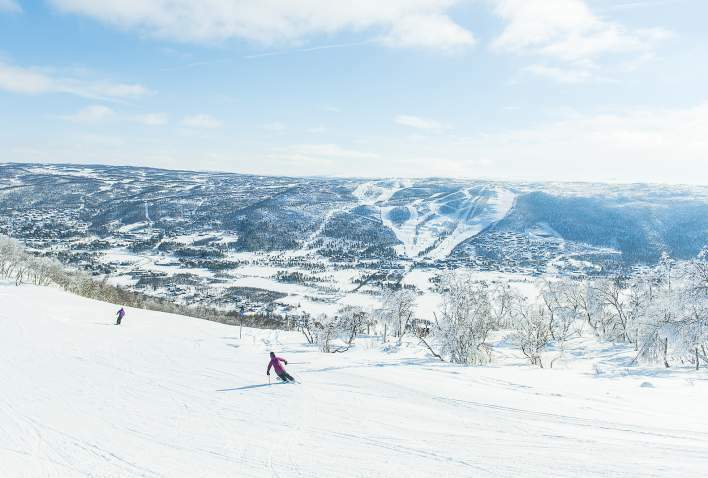 Modern ski tourism started in Geilo in 1935, when one of the first slalom races in Norway was held in Geilo. An active ski school opened as early as the 1950s. The first chair-lift opened in 1954 and Norway’s first ski course grooming machine came to Geilo in 1972. Altitude: 798 metres above sea level. Hallingskarvet Mountain Plateau: 1,933 metres above sea level. Nearest cities: Oslo (220 kilometres) and Bergen (239 kilometres). Airport: Fagernes (1 hour and 45 minutes by car from Geilo). The Bergen Railway: Geilo station in the village centre, approximately 3 hours and 30 minutes train ride from both Oslo and Bergen.